Are words really better than silence? Like most 20 year olds today, I have never been exposed to silent films. I have only ever seen films with dialogue and I did not have a particular interest in silent films. Also, silent films seem to have been forgotten because of the how advanced movies are today. This semester I am taking two media courses which have opened my eyes to the world of silent films. Silent films are able to draw viewers in without a script. They use music, facial expressions, interactions with other characters, and humor to make it a story worth watching. Films from this era have the ability to wow audiences without words, which is something today’s films lack. While watching more silent films than I ever have before, I have also been wondering what the films I watch today would be like if they were silent. Silent films are silent, so I can follow the story line by merely seeing the film, not hearing it. In some of my favorite movies of today I do not think they would be the same without sound. All of today’s movies are centered on dialogue. In fact, a lot of people quote humorous lines from movies. You have probably fit a line from a movie into your everyday conversation as a sort of comic relief. These quotes make people laugh because the movie they are coming from is funny. I believe that audiences find today’s comedies entertaining mostly because of what the characters are saying, not the events of the actual movie. To test this theory I decided to watch a popular movie from this era with the sound muted. I chose Mean Girls because it is a fairly popular film from our time that most people can summarize. Also, the plot is fairly basic, so most viewers have no trouble following it. I admit that this is one of my favorite movies and I do happen to quote the movie from time to time. After my experiment, I have concluded that this movie is fairly dull with no dialogue. The reason that this movie has received such high ratings is simply because the dialogue is humorous. Without the banter, jokes, and quirky phrases this movie is nothing special. Actually, the plot itself is ultimately boring. A new girl does not fit in, she becomes popular, becomes unpopular, and then she turns into a good person. This is not exactly the most stimulating comedy. For example, in one particular scene the main characters are at a party. The girls are dressed up in a crowded room, talking to each other, and holding drinks. It does not sound interesting in the slightest when the sound is off. However, this scene is actually funny because of what the characters are saying. Gretchen, played by Lacey Chabert, is trying to explain to Karen, played by Amanda Seyfried, the concept of cousins because Karen likes a boy who is her first cousin. Karen backs herself up by saying, “So, you have your cousins, and then you have your first cousins, and then you have your second cousins…” Obviously this scene is funny because the character sounds like an airhead. If this film did happen to be a silent film, this particular scene would have been much more comical with a more animated actress, such as Lucille Ball. She could have walked up to the boy and acted out a flirtatious encounter by talking to him, laughing, and touching his arm. Her friend would then come over and dramatically drag her away to have a serious conversation with her. 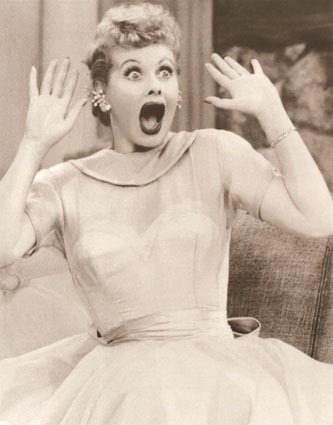 Then Lucille would give a confused look, shrug her shoulders, and shake her head. The viewer would still get the impersonation that Lucille should not be flirting with this boy because of something her friend told her. Even without words, the viewer will still understand the basic point of the scene. The point I am trying to make is that most films today rely on sound to impress audiences. If you mute the sound, you are simply watching a character go through meaningless motions. The dialogue is what makes the movies noteworthy because, without sound, the characters are basically standing around. My opinion is that even though actors in silent films had a more difficult time relaying a story, they still did a better job than actors of today because they were able to tell a story through physical movements instead of words. As of this past August, millions of people have access to old media through the pixels of new technology. 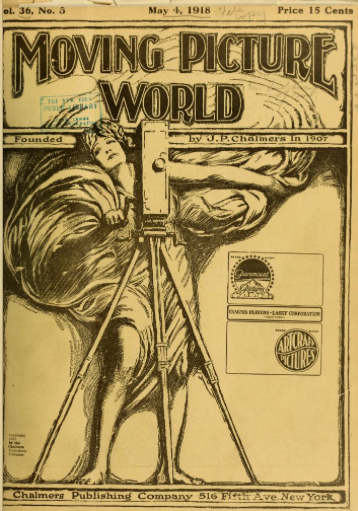 The Media History Digital Library and DOMITOR (“the international society for the study of early cinema”) have released a comprehensive digital collection of Moving Picture World, a film industry trade publication that reported on the important developments and releases in the growing movie business. 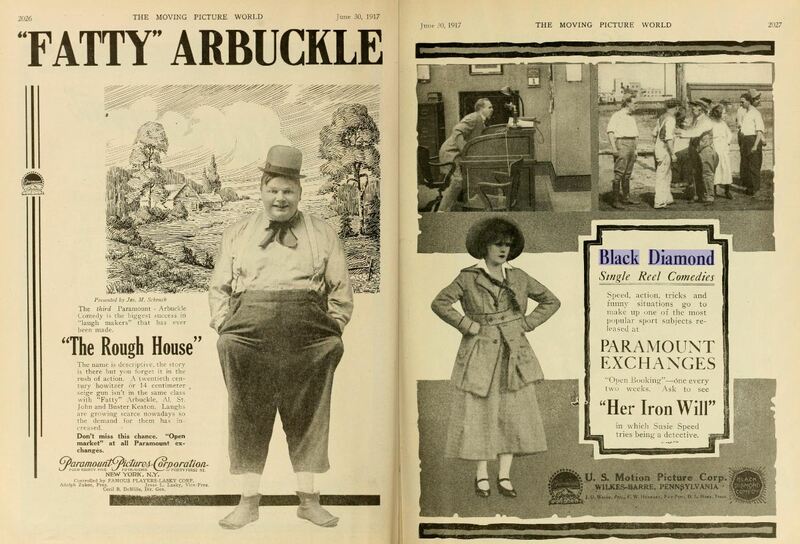 The years between 1907 and 1919 saw a transition of public media consumption to what we would consider a traditional film medium: the theater. Now that digital editions of the first 12 years of Moving Picture World are available online for free, researchers can begin to piece together a more complete account of what was going on in the film business as movies gained a cultural foothold. The collection holds 12 years of information that should be incredibly valuable to film scholars, a category of academia that suffers greatly from a lack of primary sources suitable for scholarship. Historians and film critics alike should be excited by this work because it creates a definitive base upon which to rest our modern understanding of film history and how film theory has developed since the turn of the 20th century. In its comprehensive coverage of everything film, Moving Picture World is almost an early-20th century, more professional Variety magazine. The 70,000 pages released hold film reviews, profiles of actors and directors, details of technological improvements, and ads for films that will allow readers to look back in advertising history. Blogs and social networks serve many of the functions that Moving Picture World did in its time. However, they also allow people to interact with their media landscape on a greater scale; free blogs allow amateur and professional critics alike to practice their craft, aggregators like Rotten Tomatoes provide a rough gauge of how good a film is, and social networks like Twitter point people towards exciting social developments (like broken box office records, or an actress’ failed marriage). The full-text search engine that is provided for perusing Moving Picture World will allow for greater interaction with the document. People will be able to pinpoint specific snippets of information that they want to consume and skip over the rest, as opposed to flipping through pages and passively consuming the advertising messages. On the other hand, these advertisements give a glimpse into old marketing, and so could also be valuable to scholars of communications. In a way, the efforts of DOMITOR and the Media History Digital Library have retro-fitted Moving Picture World to create a historical new media source out of an “old media” publication. Success! 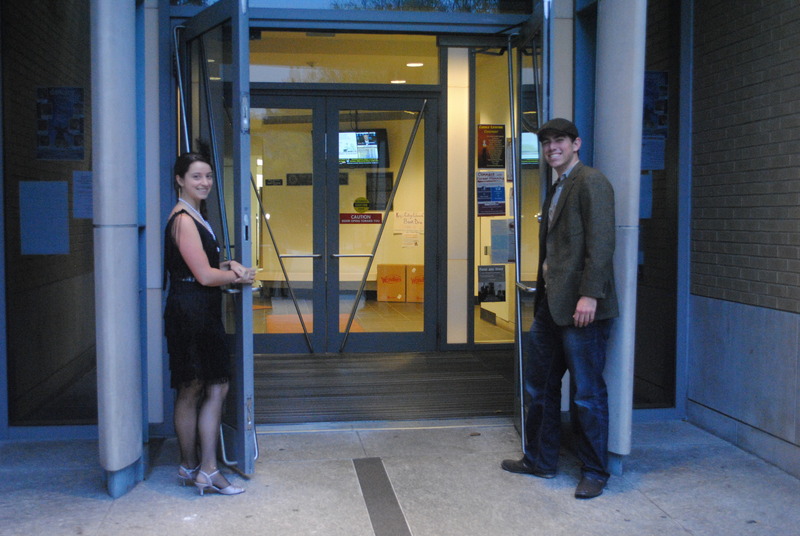 The film screening event for “Flesh and Spirit,” “His Neglected Wife,” and “Her Fractured Voice” went off without a hitch this past Friday, October 26th, just in time to celebrate an early Halloween. 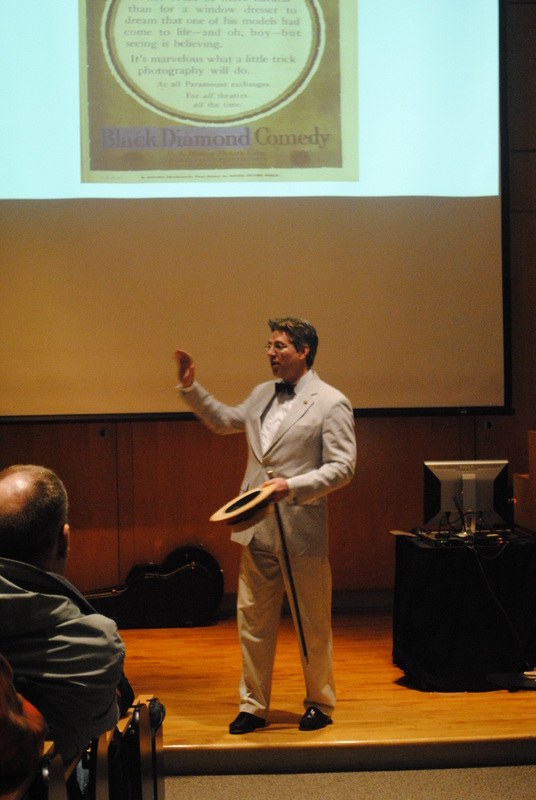 The venue for the screening, the Burke Auditorium on King’s College Campus, was nearly full with film buffs and 20s fanatics excited to be both reenacting and participating in historically significant events. These films have not been publicly displayed for decades and everyone who was present Friday night was part of the premier re-release. 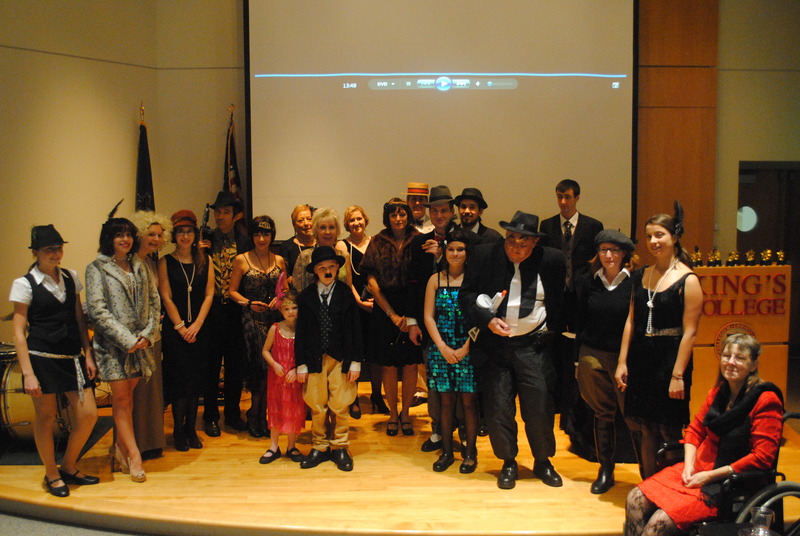 The members of the community showed great enthusiasm towards our 20s theme, many showing up in full period garb with props to match. The students in charge of distributing prizes for the costume contest were challenged to decide who was most authentic as many wore not just costumes but real clothing direct from the time. Also present were a few reincarnations of Al Capone, complete with toy machine guns and masks. To further feed the moviegoers 20s cravings, period snacks such as popcorn, Necco Wafers, Dum Dums, and MaryJanes were provided. The enthusiasm of the community most surprised us; in addition to coming fully dressed many brought stories and even more material to aid in our compiling of information about the United States Motion Picture Corporation. Some guests were even related to the figures that keeping popping up in our research. Though this screening was the culminating event for all of our research as a professional writing class, it seems that instead it has sparked a new wave of questions and a new level of interest which will hopefully extend out into the community. Perhaps then we will find some more of the answers we are seeking.